he Parker "100" was definitely a grandson of the Parker "51". It was designed by Geoff Hollington, who also worked on the Insignia and the Sonnet. He borrowed the overall design from the Parker "51" but nevertheless managed to give the pen distinct and very attractive features. It's both longer (142 millimeters) and thicker than the Parker "51". Parker had introduced the Sonnet Premier trying to capture the price segment between the Sonnet and the Duofold but decided to launch a new model. It was introduced in the 2004 catalog as a pen that possessed "the perfect combination of understated status and sharp, individual style." Acknowledging the Parker "51" heritage with "Parker's distinguished legcy and vibrant future juxtaposiong classic and temporary." The caps were 14k gold plated with gold plated/nickel palladium trim and the body was made by multiple layers of laquer on a brass base with a thin cap ring and a broader body ring. The pen was fitted with a 18k solid gold nib. The Opal silver and Cobalt Blacks didn't have the gold caps, but rather a titanium coated graphite grey cap. The Opal Silver and Cobalt Black CT was also fitted with nickel palladium trim and a rhodium plated 18k gold nib. The newly designed clip were was sleek and the inserted nickel palladium "jewel" on the clip and recessed at both ends created a stunning effect. The Parker "100" was offered in the standard nib sizes of extra fine, fine and medium and also in the non standard sizes of left oblique in fine, medium and broad, and dito for straight itlic nibs, while the reverse oblique nib was offered in medium only. 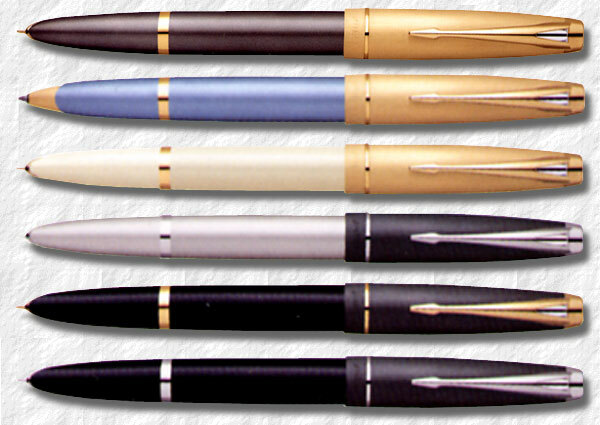 The Diamond Blue and the Honey White was phased out in 2006 and the Parker "100" was discontinued in late 2007. It has caught on among collectors and is very popular, maybe because of it's kinship with the classic Parker "51" and also because of it's relatively short run and limited range of colours.